In the fourth grade while a couple of boys sat crying outside the classroom, my teacher sat the rest of the class down and explained that these boys were crying because their conscience hurt. They had been involved in a fist fight during recess. She explained that a conscience is an inner voice that tells us right from wrong. These boys had done wrong and felt bad. She told us that when we do good things, we feel good, and when we do bad things, we feel bad. She counseled our class to give heed to that inner voice. If we did, she taught, we would never stray very far from living a good life. This sort of lesson was not uncommon thirty years ago. Most people understood the importance of a conscience. Most people heeded their own conscience. Thirty years is a lot of time for things to change. And change they have. Instead of a genuine understanding of conscience, the very idea that there is good and bad has diminished. Along with the diminishing idea that some things are good and some things are bad has come the idea that conscience doesn’t matter. 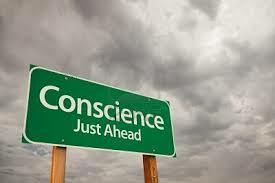 Since, a lot people feel like consciences do not matter, the right to have a conscience is diminishing too. Nurses who did not want to participate in abortions. Wedding vendors who do not want to participate in gay marriages. Religious leaders who feel obligated to preach the biblical views of homosexuality. Students who do not want to participate in the liberal agendas taught at their Universities. Business owners who do not want to be involved in supplying abortifacient drugs. And more… Some of these people have won their court cases and regained their right to conscience, some have lost, and some cases are still pending. These attacks on conscience will likely increase. Those who still believe that there is such a thing as bad and good and right and wrong need to stand up and defend the right to conscience whenever and wherever it is breached. My fourth grade teacher was right. That inner voice does tell us right from wrong and a good government will be sure to have laws that allow everyone to listen to and heed their own consciences.